It’s time for my first Foodies Read book! Foodies Read (hosted by Heather at Based on a True Story) is all about the food centric books, reviewing them, and sharing. 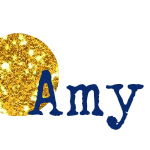 Being me, I decided to add an extra challenge and cook something inspired by each book, too. My goal is to read at least 12 foodie books this year! 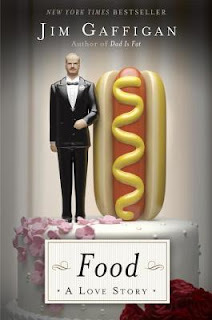 My first book is Food:A Love Story by Jim Gaffigan. This book was a reread for me (you can see my review on GoodReads here), but it is hysterically funny and I was in the mood for some laughs. In a sentence: Gaffigan loves food! 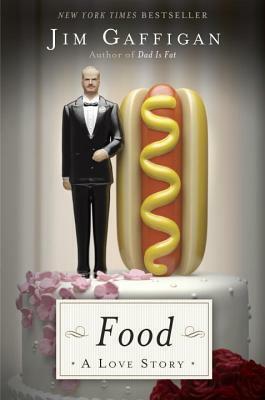 The book goes through his favorite foods, his guilty pleasures, and his not so favorite foods (we are like minded as far as seafood – or “seabugs” according to Gaffigan – goes), with amusing anecdotes along the way. The book begins almost like a case study for overweight Americans, but then quickly eases into the comedy! Don’t read this book on an empty stomach! Now for the inspiration! There were so many foods I wanted to make! But the calorie count on many of the recipes (like poutine) was just too high! So I went for BBQ. Depending on where you live, BBQ might be something you eat, something you do, or a sauce. Where I live, BBQ is a sauce. I’ve always wanted to make a good BBQ pulled pork, but I get weirdly hung up on adding an entire bottle of BBQ sauce to a recipe. I don’t actively avoid high fructose corn syrup (a common ingredient in commercial BBQ sauce) or added sugars, but using an entire bottle of the stuff in one meal freaks me out (yet I’m ok with Coca Cola Pulled Pork or Dr. Pepper Pulled Pork – I know, it makes no sense. I faced a similar conundrum with the canned chili vs. Velveeta debacle). Anyhow, I came across a no sugar added BBQ sauce that sounded like a winner! It’s paleo friendly, if you’re into that kind of thing (I’m not), and uses pineapple as the sweetener. It adds nice tang for the BBQ! I’ve added a few different options for the heat factor. I’ve used buffalo rub (or sauce) and chipotle peppers in adobo. They are both excellent options! 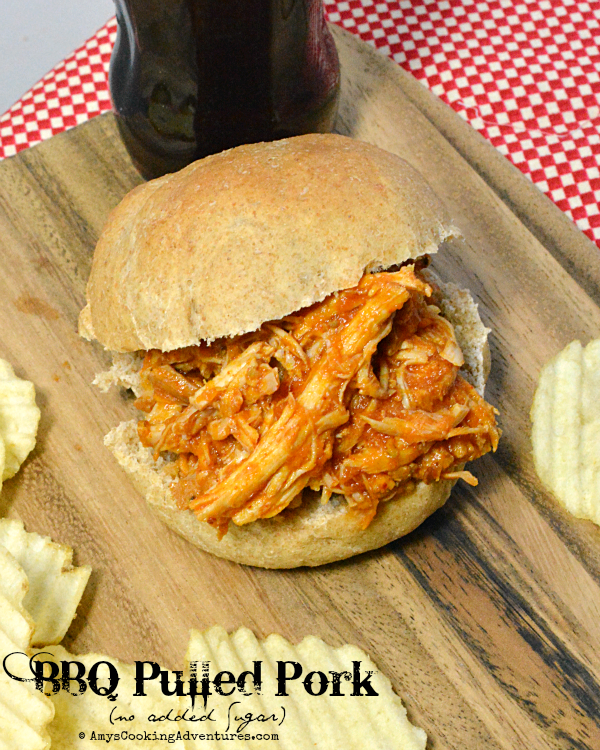 The chipotle peppers make a spicier BBQ and the buffalo rub adds just the perfect hint of heat. I go back and forth with what I use, depending on how much spice I want! Season the pork roast on all sides with salt and pepper. Place in a 4 quart slow cooker. Place the remaining ingredients into a blender and blend until smooth. Pour the sauce over the roast. Cover and cook on LOW for 8-10 hours or HIGH for 4-5 hours. About 30 minutes before serving, remove the roast from the crockpot and remove any visible fat. Shred the meat with 2 forks and return to the slow cooker. Cook for another 30 minutes on HIGH and serve. Sounds like a book I may need to pick up....can never have too much laughter in your day. I laughed so hard while I was reading that book. I never reviewed it though. Might be worth a re-read! I love the idea of cooking something inspired by the book you read. I am looking forward to seeing what you read (and what you make too of course). 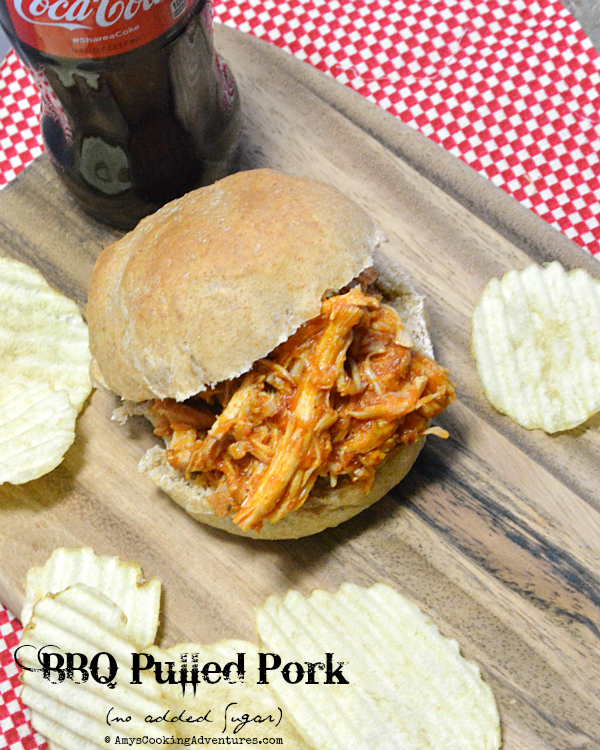 Yum, pineapple sweetened pork! I have read this one too and laughed and laughed.. He is a funny guy..and tells the honest truth! That sandwich looks delicious, and the book sounds hilarious. It's been on my to-read list for a while, maybe I ought to move it in line!